Georgian is an ancient language which is still spoken today by some four million people within the Republic of Georgia, located in the southern Caucasus wedged between Russia and Turkey. It is also estimated that some 5 million more Georgian speaking people are in diasporas throughout the United States, Canada, France, and Argentina. We’re currently creating the audio recordings for these lessons, they will be available shortly. Follow us on Twitter or Facebook for updates. Georgia is a unique country located on the slopes of the southern Caucasus Mountains along with the northern foothills of the Trialeti, Achara, and Gomboli Mountains to the south. These mountain ranges are believed to be a part of the Transcaucasian Mountain Chain, the Trialeti and Achara Mountains are separated from the southern slopes of the Caucasus Mountains by two wide valleys, the Supsa Valley, which is created by the Supsa River, flowing from the Caucasus south into the Black Sea and the Mtkvari Valley, which is carved by the Mtkvari (sometimes known as the Kura) which branches with the Alazani River and eventually flows through neighboring Azerbaijan into the Caspian Sea. The Gomboli Mountains are basically a combination of low altitude hills and plateaus in the easternmost region of Georgia, known as Kakheti. These hills are separated from the Caucasus by the Alazani Valley, which spans over most of the Kakheti region. Rivers which flow through Georgia or are considered major rivers include the Mtkvari, which flows through Georgia’s capital, Tbilisi, Mtskheta, Gori, Borjomi, Vale, and from their meanders through Kars, Turkey. To the East, the Mtkvari joins another major Georgian river, forming a large lake in Azerbaijan, the Alazani River. The source of the Alazani River is in the high Caucasus near the Russian border and flows throughout Kakheti in the very wide Alazani Valley. Before joining the Mtkvari in Azerbaijan, the Alazani does make part of the border with Georgia and Azerbaijan. In the western part of Georgia, the Supsa begins in the foothills of the Caucasus in the Guria region near Ozurgeti and makes its way into the Black Sea near Poti. In the southwestern-most part of Georgia, the Choroki River lets out in the Black Sea just south of Batumi near Batumi’s International Airport. The Choroki River has its source in Turkey and flows through many towns just south of the Georgian border, such as the town of Artvin, where a language known as Laz, related to Georgian is spoken. The Ibero-Caucasian group is the larger linguistic group to which Georgian belongs – more specifically, Georgian belongs to the Kartvelian group of languages. Besides the Kartvelian group, the Ibero-Caucasian group contains many unusual languages which cannot be determined to belong to a group in particular, but some languages which are different from Georgian which are bunched into this group are Albanian, Ossetian, Abkhaz, Ingush, and Cherkezian*. Narrowing the linguistic group to the Kartvelian group, Georgian is the only language in the group which is the official language of a sovereign nation. Furthermore, Georgian is the only literary language in the Kartvelian group and possibly the only literary language in the entire Ibero-Caucasian group. Besides Georgian, other languages in the Ibero-Caucasian group use either the Latin or Cyrillic alphabets as their literary languages, though some of the Kartvelian languages related to Georgian spoken in parts of Georgia will use a form of the Georgian alphabet for literary purposes. Otherwise, these languages all originated as oral languages. The Kartvelian Group is a group which has two linguistic branches. These branches include the Colhetian branch and the Kakheto-Kartlian branch. 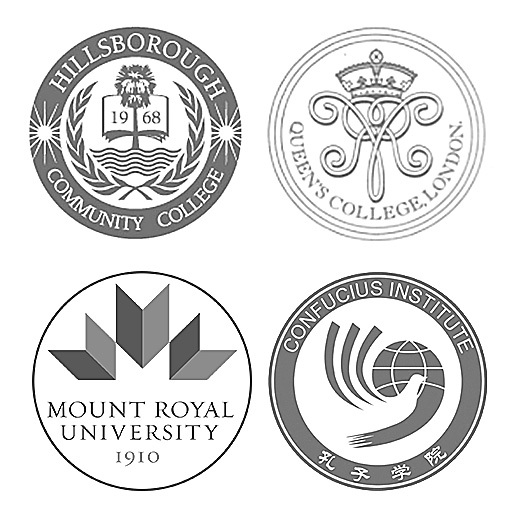 Though the languages in both of these branches are related and have similarities with a similar grammatical structure, they are in fact different. Georgian is the only language in the Kakheto-Kartlian branch of the Kartvelian group which is still spoken today. The Colhetian branch includes languages related to Georgian, but they differ greatly. These languages include Laz, Megrelian, Svan, Basque, and Corsican. Basically, Svan is a language which is related to Georgian, yet has many nuances which differ greatly from modern Georgian. Svan is spoken by local people in the Svanetia region of Georgia. This region is located in the western part of Georgia in the high Caucasus. 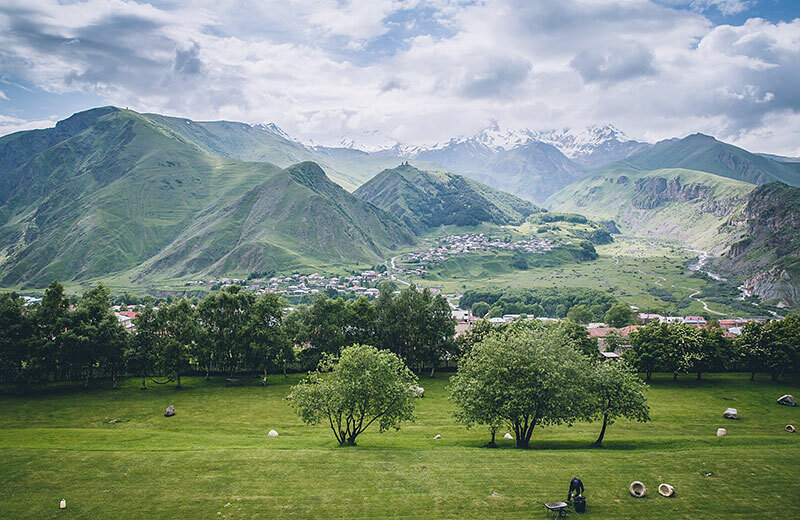 Svaneti is near the Russian border and also to the west of Svaneti is the breakaway region of Abkhazia. What makes Svan differ so greatly from Georgian is that it has a mix of Abkhaz and Ossetian words. Laz and Megrelian are basically two dialects of the same language. Megrelian is spoken by the largest minority in Georgia. This minority is typically from the Samegrelo region of Georgia, however, Megrelians can be found throughout Georgia and many of them live in Tbilisi and are successful in business or hold key positions in the Georgian government. Laz is very close to Megrelian and if you understand Megrelian, you will understand Laz. Laz is spoken by a group of people in the southern part of the Adjara region of Georgia along the Turkish border south of Batumi. The most famous town where Laz is spoken is the border town of Sarpi. Basically, Sarpi is half in Georgia and half in Turkey, and the official land crossing from Turkey to Georgia into Batumi is in Sarpi. Besides that, Laz is primarily spoken in the Turkish towns of Kemalpasha, Rize, Artvin, Trabzon, and can be heard as far as Cappadocia. While reading the above, you’ve probably noticed that Basque and Corsican are also languages in the Kartvelian group and the Colhetian branch. This is basically because both the Basques and Corsicans are ancient Laz people who migrated westward over five thousand years ago for some unknown reason. Archeologists believe that the Basques settled in the Pyrenees on the Franco-Spanish border because this mountainous terrain is similar to that of the low mountains around Sarpi and northeastern Turkey. Why the Corsicans migrated to the French Mediterranean island of Corsica is a mystery. Some archeologists believe they may have been seafarers who originated from the Black Sea coast near Batumi. Some linguists who are experts in the Kartvelian and Ibero-Caucasian languages believe that there is a strong direct relation between Laz and Basque, and a moderate relation between Laz and Corsican. Another similaritiy which leads archeologists to believe that Basques and Corsicans are of Caucasian origin is that their singing is very similar to the polyphonic singing in Georgia. Dental patterns also show relations between the Basques, Corsicans, and ancient Georgians. 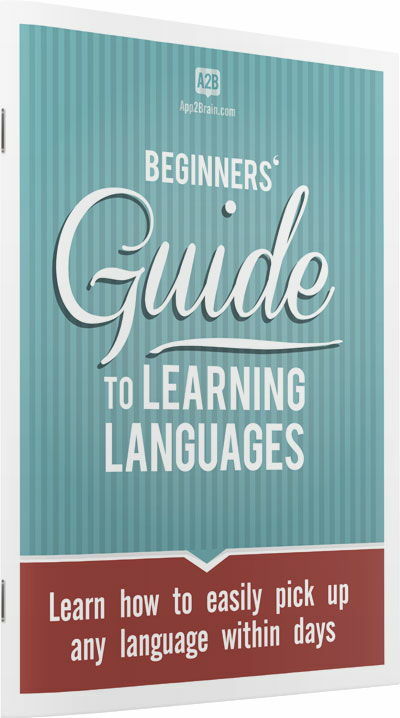 To learn a language effectively, you must learn the culture related to that language. This is because idioms and certain other nuances of a language have their origins in the culture related to that language. Georgia is an ancient country which can trace its existence back over seven thousand years. The Georgian people originated from the ancient kingdom of Urartu which spanned over the southern Caucasus and eastern modern-day Turkey over seven thousand years ago. It is also believed that some of the ancient Urartu peoples were Sumerians and ancient Aramaic peoples. It is from which evolved the modern countries of both Georgia and Armenia. Evidence of the ancient kingdom of Urartu include the famous cave towns throughout Georgia. 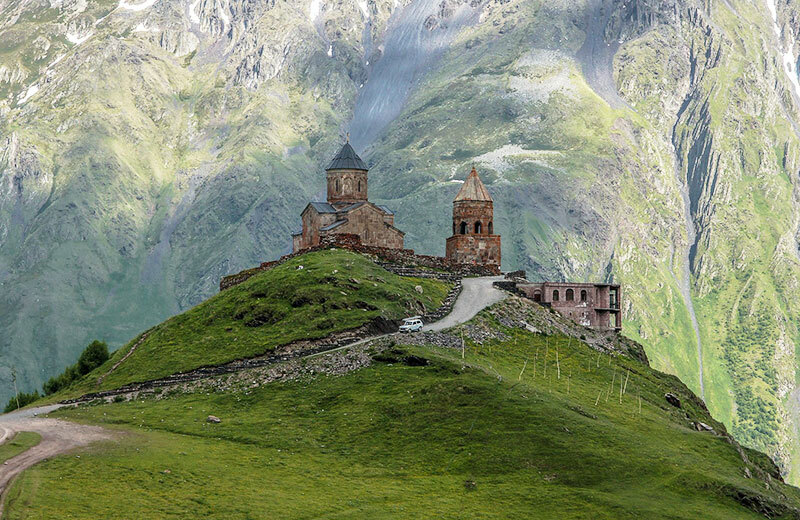 Most of these cave towns have since become monasteries, such as the Davit Garedji Monastery in the southern part of the Kakheti region and Vardzia on the banks of the Mtkvari River in the southern part of the Borjomi-Javakheti region of Georgia. Uplistsikhe, on the other hand, is a cave town located on a hill overlooking Gori and is one of the historic treasures declared to be in protected status by UNESCO. Uplistsikhe is a museum and you can get guided tours to visit Uplistsikhe and is highly recommended for history lovers. 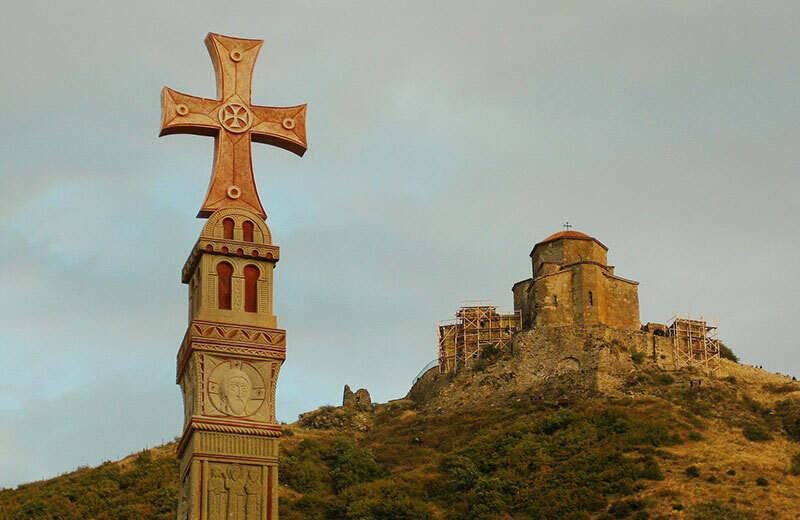 The predominant religion of Georgia is Orthodox Christianity. Georgia has its own Orthodox church with its own synod and patriarch. The Georgian Orthodox Church is in union with the Russian Orthodox Church and is confessed by over 90 percent of the Georgian people. Orthodox Christian rituals, prayers, and feast days play a huge role in Georgian culture. Other religions in Georgia include Islam, which is practiced by a small minority in Batumi and the Autonomous Republic of Adjara within Georgia. The Adjara region and Batumi were originally Christian, but with 300 years of Turkish occupation, many of their ancestors were forced to convert to Islam. The youth in Adjara and Batumi, however, are converting to Orthodox Christianity. There is also a small minority in Kakheti near the Azerbaijani border who practice Islam. These people include Azeris, Leks (Chechens living within Georgia) and ancient Persians. Many of the Muslims in the easternmost part of Georgia are referred to as Tatars by the locals, though most of their languages are in the Turkic group. Small pockets of paganism can be found in parts of Abkhazia and among the Georgian Kurdish minority. These pagans are typically sun worshipers and are a carryover from the pre-Christian days of Georgia. Food and the supra (a traditional Georgian feast held on a table-cloth-like surface which is also called “supra”) are a pivotal part of Georgian culture. Everything in Georgia is done around a meal, which has always been an important part of Georgian culture. This does include birthdays, name’s days, weddings, funerals, and other special festivities, but many business transactions are also done at the supra. Many Georgians who are in business and government will have a small supra in their meeting rooms where the food is always accompanied with some of the finest Georgian wines. The Georgian supra is a special art and has a special etiquette which is followed. Wine is not nursed as it is done in France, Germany, and in other parts of the West. Instead, at the Georgian supra, wine is served by the pitcher and poured in regular 250 g glasses. Each Georgian supra has two key people among all the invited guests. The first is the tamada. The tamada is the host of the supra. He usually will be the first to raise a glass of wine and offer a toast. When the tamada raises the glass, everyone must raise their glass and after the toast is said, everyone must drink the wine to the bottom. Glory to God in the Highest is the very first toast said by the tamada at any supra. This is a custom which is related to Georgia’s deep relation with the Orthodox faith. There are many variations to this toast and many will say “Glory to God in the Highest, Peace on Earth, and good will among men!” Again, the faith among most Georgians gave birth to this toast. Furthermore, throughout Georgia’s history, the Georgian people have survived many wars, thus peace is something important to most Georgians. To the occasion is typically a toast which follows the above mentioned toast. This occasion can be a feast day, a birthday, a business transaction, or some other occasion the supra was spread out. To all parents is typically another toast said by the tamada at a supra. Family is very important to Georgians. If the tamada is young and his elder parents are present, he is expected to raise a glass to them and to the parents of all present. To the guest of honor is also a very important toast. Every supra has a guest of honor. In fact, next to the tamada, the guest of honor is the second most important person at the supra. The Georgian people are a very friendly and hospitable people and don’t be surprised if you visit Georgia and are invited to a traditional supra, you will be named as the guest of honor. 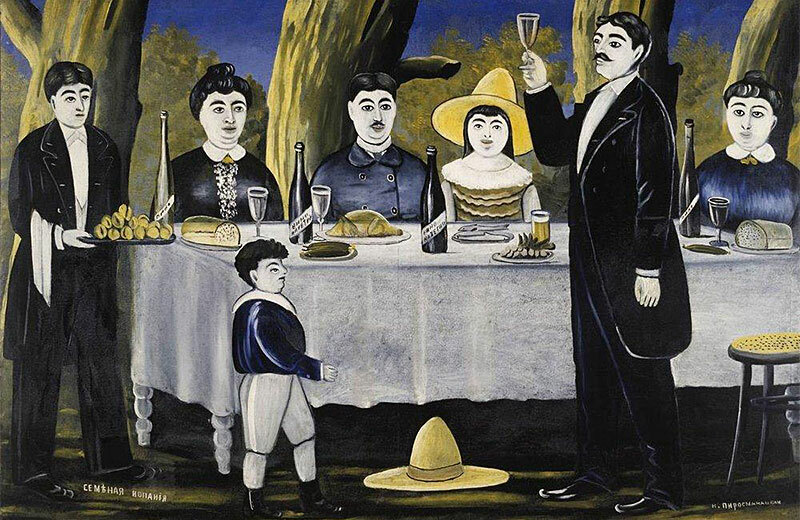 As a guest of honor, once the tamada raises a glass in your honor, it is customary for you to publicly thank the tamada before all present before drinking to the toast. Keep in mind that being the guest of honor at a Georgian supra is not for those with low alcohol tolerance. Traditionally, at a supra, the old-school tamada will have two hollowed out ram’s horns. One is filled with wine for the tamada, and one is filled with wine for the guest of honor. Those big ram’s horns are more usually seen in villages rather than in large cities such as Tbilisi or Kutaisi, though it can happen there too. It is customary for the guest of honor to drink his or her horn empty after the tamada says the toast. To all women present is a big one. Every supra will have a toast in honor of all the women present. When the tamada raises a glass in the honor of all women present, it is customary for all the men at the supra to stand up and drink to this toast while standing up. To those not present is typically a toast to the loved ones of those present at the supra who have passed away. Everyone typically stands when they drink to this toast. In some parts of Georgia, it’s customary to dip a piece of bread into the wine when toasting the dead. To all children present and the future of our nation is typically a toast to all the children and grandchildren present at the supra. 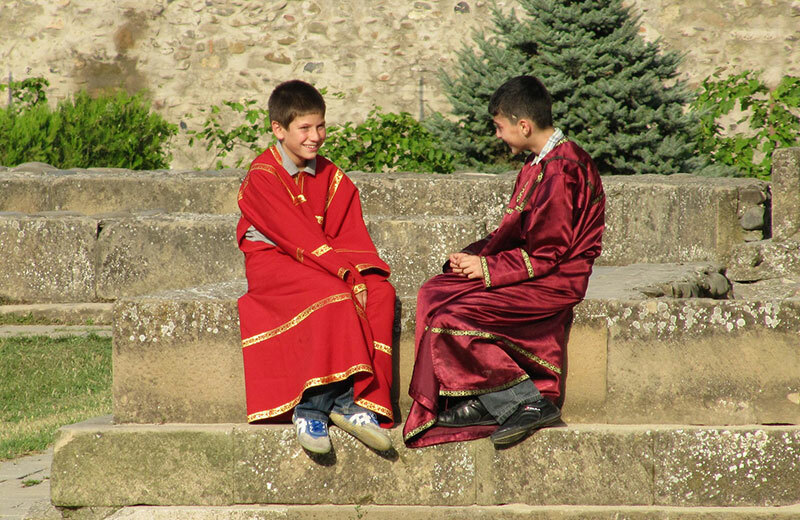 Unlike many of the straight laced cultures where children are seen, not heard, this is not a description of the Georgian supra. Children are just as much a part of the supra as the adults. Children don’t need to sit still. They can move around, play, and be kids. Children are loved greatly in Georgia and every tamada will raise a glass to all the children present. These above mentioned toasts are the most common toasts you will encounter at most Georgian supras. Some tamadas will even have more toasts during the course of the supra along with the ones mentioned above. Weights and measures in Georgia are like in most European and Asian countries. Georgia is on the metric system, so distance and speed limits are set in kilometers, weights are measured in grams and kilograms, liquids and fuel is measured by the liter. Acreage in Georgia is measured by the hectar, which is 100 square meters, the equivalent of two and a half US acres. Georgia’s national currency is the Lari. The Georgian Lari comes in both coin and banknotes. One and two Lari denominations can be in both banknote and coin form. Five Lari and above are denominated only by banknotes. 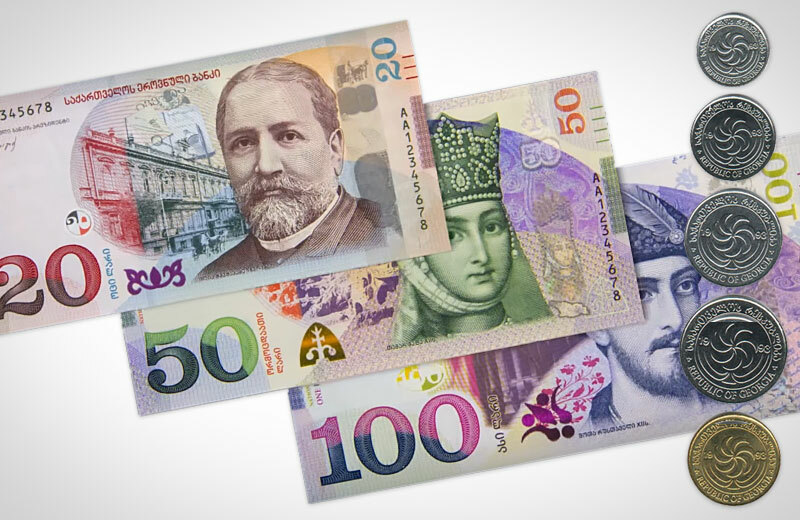 Banknote denominations of the Georgian Lari are one, two, five, ten, twenty, fifty, one hundred, five hundred, and one thousand is the largest. The Lari is divided into 100 units which are known as Tetri. Very rarely will you find anything under a whole Lari and currently, it’s around 2 Lari to the US dollar. 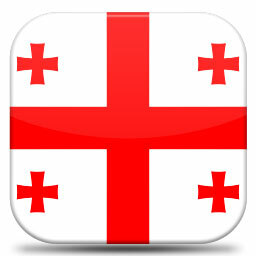 Georgia’s government is considered to be a republic. Georgia has a president and the ruling body is a parliament. The Georgian president is elected every four years and members of parliament are elected every two years. Georgia has a political map which consists of three autonomous republics, which include Adjara, with its central government located in Batumi, Abkhazia, with its central government located in Sukhumi, and South Ossetia, with its central government in Tskhinvali. Adjara and Batumi are quiet and safe to travel to. Abkhazia and South Ossetia want to break away from Georgia and it is currently not recommended to travel there. Along with the three autonomous republics, Georgia is divided into regions, which are Samegrelo, with its seat in Zugdidi, Guria, with its seat in Ozurgeti, Svaneti, with its seat in Mestia, Racha, with its seat in Oni, Imereti, with its seat in Kutaisi, Borjomi-Javakheti, with its seat in Borjomi, Shida Kartli, with its seat in Gori, Mtskheta-Mtianeti with its seat in Mtskheta, Kvemo Kartli, with its seat in Bolnisi, Kakheti, with its regional seat in Telavi, and Tusheti, with its regional seat in Shatili. Georgia’s capital is Tbilisi, which is located on the banks of the Mtkvari River and nestled between Shida and Kvemo Kartli. Tbilisi is also Georgia’s largest city with a subway (metro) system of two lines, though a third line is under construction. Georgia’s government institutions are located in Tbilisi, as is the Presidential Palace. The parliament used to be in Tbilisi, but under the Saakashvili regime, parliament was moved to Kutaisi. Local municipal and regional governments in Georgia usually consist of a council and a mayor for cities and towns, a governor and a regional parliament for the regions. Georgia’s products and national industry include wine, fruit, textiles, and tourism. Wine is huge for Georgia. In fact, Georgia is known for its wine making tradition which can go back to the days of Urartu. Archeologists have found wine making paraphernalia in Georgia which date back over five thousand years. Wine has been rooted in Georgian culture for millennia. During the days of Soviet rule, Georgia has been known for its textile industry. Throughout the Soviet Union, clothing, bed linens, and shoes made in Georgia were known to be of the best quality. Because of Georgia’s subtropical climate in the valleys and the Black Sea coast, Georgia has a modest fruit industry which includes pomegranates, quince, apples, peaches, apricots, pears, figs, oranges, mandarins, lemons, and limes. Along with wine, tourism is a very large industry. Georgia has always been praised for its hospitality and there are many things to do and see in Georgia. These include ancient castles, fortresses, churches, and ruins. Georgia has areas in Bakuriani and Svaneti which are great for hiking, skiing, and camping. Many regional Georgians will also have bed and breakfasts where you can stay and enjoy traditional Georgian cuisine. Famous people and cultural contributions from Georgia are manifold. One of the most infamous Georgians is, of course, Joseph Stalin. 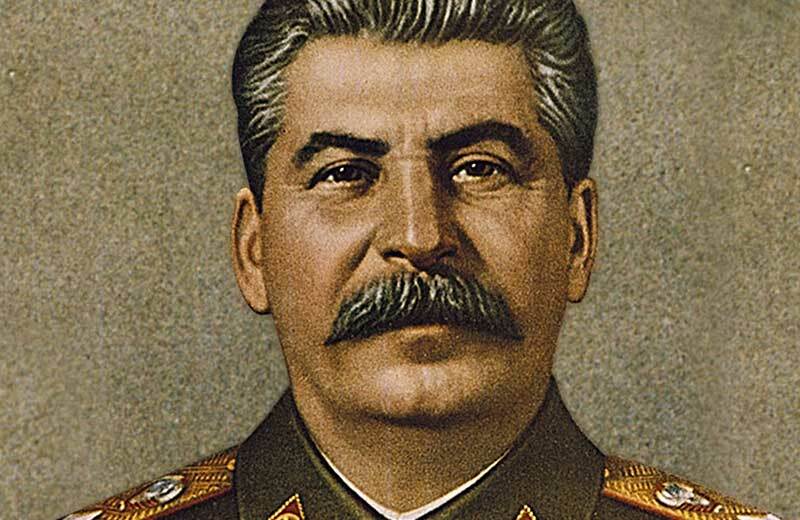 We all know Stalin’s claim to fame as being the brutal head of the Soviet Union until his passing in 1954. Stalin was actually born in Gori and the house he was born in is now a museum and part of a huge museum complex dedicated to his life, which even includes the railway wagons Stalin travelled in when he went to Potsdam at the end of World War II. სოსო ჯუღაშვილი, soso jughashvili. Another infamous person from Georgia was Stalin’s head of the NKVD, Lavrenti Beria, who is of Megrelian origin. Though these two men are a dark spot on Georgia’s history, many other people from Georgia and people who lived in Georgia contributed to the world. Eduard Shevardnadze, who was Gorbachev’s foreign minister is also Georgian and was the President of Georgia from 1993 to 2003. Igor Stravinsky, a 20th Century classical composer who fled Russia after the 1917 revolution, was actually a Russian but grew up in Georgia as his father was a civil servant for the Tsar. Georgian polyphonic singing influenced much of Stravinsky’s music. In the United States, Bill Clinton’s Joint Chief of Staff for a while, John Shalikashvili, was of Georgian origin. In the Russian film society, one of Russia’s greatest comedy film producers, Giorgi Danelia, was also a Georgian of Megrelian origin.